Recently, I've enjoyed a series called "Framework" found on the on-line edition of the Los Angeles Times, featuring photographs from the past and present. This one, entitled "Car, pool" caught my eye. 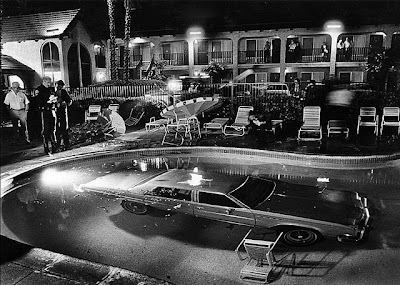 On March 18, 1984 Managing Editor Colin Crawford took this shot of a car that ended up on the bottom of the swimming pool at the Costa Mesa Inn (located south of Los Angeles in Orange County). Reflecting back, Crawford said, "The good news is that because there was no loss of life or major injuries, it’s an image that you can look at and laugh about. The things we Southern Californians do with our cars never cease to amaze me." Great photo. A combination of technical skill, and being at the right place at the right time. A link to the original photo can be found here.